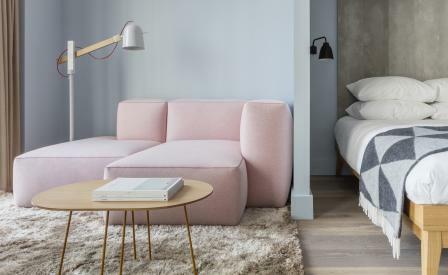 With a blend of dusty pink upholstering, industrial furniture and sheepskin rugs, you might think the rooms at Leman Locke were the result of a domestic design commission – but you’d be wrong. Located a short stride from East London’s buzzing Brick Lane, the property is a new aparthotel concept that fuses the benefits of an Airbnb rental with the facilities of a boutique hotel. Catering to this new audience, the 168-room property – designed by New York-based Grzywinski + Pons – includes a 24-hour gym, a series of meeting rooms and co-working spaces and a Treves & Hyde Lounge and Purist cocktail bar that taps into East London’s famed food and drinks scene. Instagram-friendly rooms feature L-shaped sofa beds, living rooms and a kitchen, while hallways have been transformed into cosy nooks and modern meeting spaces, ideal for an upcoming events calendar which includes tech meet-ups and gin tastings. It’s this smart approach to space that gives Leman Locke the edge, highlighting the modern traveller’s need for stylish interiors of a boutique establishment, with the convenience of rented accommodation.